Setting up the season finale in Homestead, the IZOD IndyCar round at the Twin-Ring Motegi oval is almost more important than that Florida round on the basis of being a championship prelude. 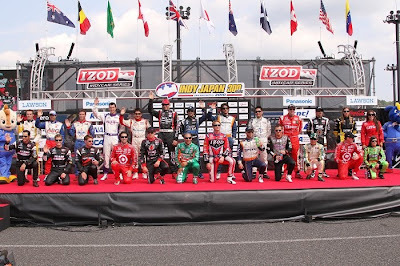 Entering the Indy Japan 300, the overall championship battle between Will Power and Dario Franchitti is one of the tightest of tight battles of past IRL/IndyCar seasons. Besides the champion fight, every one of the 25 IZOD IndyCar Series drivers are vying for to best others racing around the 1.55 mile oval. Showing stunning speed in qualifying for the Twin-Ring Motegi's Indy Japan 300, Penske Racing's Helio Castroneves led the field through turn one as the Indy cars proceeded to complete the first lap. However, a chance of a second green flag lap would be halted by Bertrand Baguette's Conquest car sliding out of control on turn 2, lap 2. A short race for the Belgium native, Baguette was cleared as being fit by medical officials following the accident. For the first 70 laps around the Twin-Ring Motegi, Helio Castroneves reigned at the front as a battle behind him ensued between Target/Chip Ganassi Racing's Dario Franchitti as he tries to better the Penske Racing drivers Will Power and Ryan Briscoe within the top-5 positions. This would be a race-long battle as the grouping maintained close for all the 200 lap distance. Car slows again on lap 39 as the Dale Coyne Racing #19 stalled on the apron drawing on caution on lap 43. Later to be recognized by team mechanics as a throttle linkage problem, Lloyd would be able to rejoin the Indy Japan 300 field several laps down. 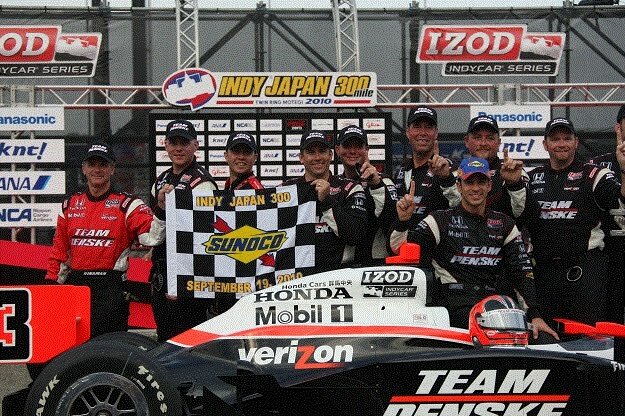 Leading the Twin-Ring Motegi event by more than 3 seconds over second place, Helio Castroneves' #3 car was brought back into sight for Ryan Briscoe and Dario Franchitti. The yellow flag created a moment for Indy cars to pit as Castroneves led the #10 of Dario Franchitti and the #6 of Ryan Briscoe. On the pit stop for the wide variety of competitors, Castroneves preserved his lead position but Briscoe leapfrogged Franchitti for 2nd place providing the Penske Racing team a valuable cushion not only to for Castroneves' #3 car but for Will Power's championship hopes (though a great deal of the IZOD IndyCar's Indy Japan 300 was still left to be run). The field restarted on lap 47 with Helio Castroneves again working his dominant car on top of the IndyCar drivers. 21 laps later, a frightening crash in turn 2 occurred when Mario Moraes' #32 KV Racing Technology car broke loose, smashing hard into the outside retaining wall. Possibly the result of a mechanical failure, some sparks from the rear left corner of the #32 car were visible just prior to Morae's hard impact. Conscious and physically moving within the car, Mario Moraes was carefully extracted with assistance out of his KV Racing Technology car by safety officials. Taken to a local hospital, he was released late Sunday night after getting cleared by doctors. As this recent incident involving a KV Racing Technology car, the mechanical failure has called into question whether the constant rebuilding of the race cars must have left them in a weakened state. Co-Editor for Morefrontwing.com Steph Wallcraft queried regarding this on Twitter. Through a long caution where many cars returned to pit road, the #2 Dragon/de Ferran Racing vehicle of Raphael Matos and the #06 Newman/Haas/Lanigan Racing car of Hideki Mutoh stayed on track to claim important tract position. Leading 5 laps under caution followed by 10 more as the green flag resided over the Twin-Ring Motegi, Raphael Matos would be the only non-Penske Racing car to lead this Japan race (though its noteworthy that one of Matos' team co-owners is Roger Penske' son Jay). Ryan Briscoe took the race lead on lap 86 while teammate Helio Castoneves was working on a recovery from a poor restart 10 laps prior. As the #2 and the #06 played their strategy for getting to the front, they inevitably needed to pit as Matos stayed out until lap 103 while Mutoh ducked in one lap later. As Ryan Briscoe lead for 32 laps, the Australian driver of the #6 car would be the 3rd and final driver to lead the Twin-Ring Motegi Indy Japan 300. Speeding back to the lead for lap 118, Helio Castroneves took a definitive possession of the 1st place position in pit lane under caution. The #24 Dreyer and Reinbold Racing car drvien by Paul Tracy slid out of the groove and brushes the wall to draw this lap 114 yellow. Though Tracy returned to the pits, the Canadian's day was over in Japan. A final caution for the IZOD IndyCar Twin-Ring Motegi fell on lap 148 Alex Lloyd as slides into the turn 2 outer wall skimming down the backstretch. Providing one last opportunity for what would be a futile chance for Ryan Briscoe and Dario Franchitti to defeat Castroneves, the competition amongst themselves leaving pit lane was puzzling. Out of the pits, Briscoe's #6 Penske Racing car flew by the #10 of Dario Franchitti at the exit line making it appear that Briscoe grabbed the 2nd place on the race's restart. 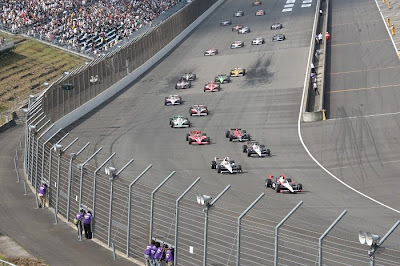 However, Indy cars circulated around the Twin-Ring Motegi for a long 19 laps as on-track safety crews cleaned up the #19 car, IndyCar officials ordered the #6 Penske of Ryan Briscoe start behind Franchitti. Admitting his finger slipped off the pit road speed limiter button when he shot by Franchitti, Briscoe was never ruled to have committed a pit road speed violation. 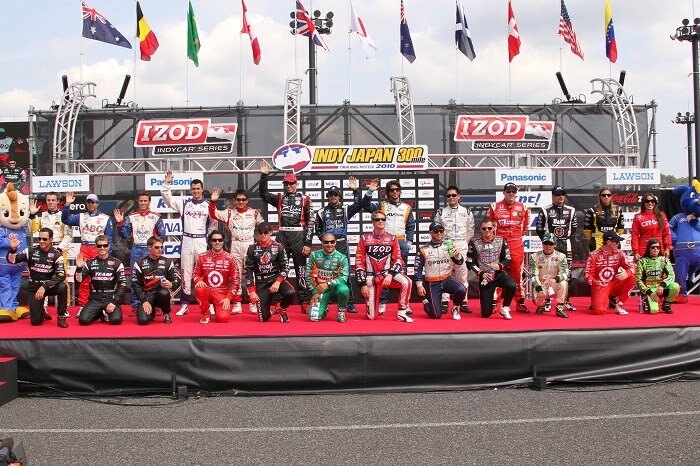 Earlier in the Indy Japan 300 race, FAZZT Race Team driver Alex Tagliani was sent to the back of the pack for a speeding penalty. Into a final 34 lap green flag period, Castroneves pulled away while the fight for second was, too, a short-lived fight on the restart as Dario Franchitti left Briscoe after the #6 car was able to try one quick but unsuccessful move for the runner-up spot. Slower than on the previous run, Ryan Briscoe was later lost 3rd place to teammate Will Power who is devoted to minimizing or neutralizing any point gains Franchitti looks to obtain in Japan. 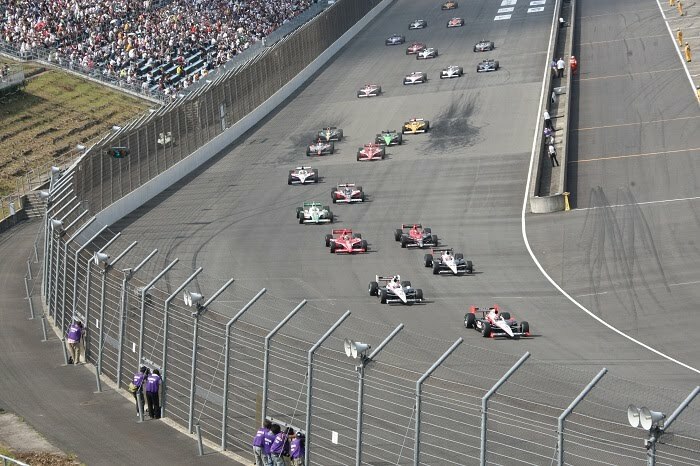 One spot behind the #10 car and closing through the final laps of the Indy Japan 300, Power was unable to complete a pass on Franchitti despite having extra Push to Pass power on tap. At the line by 4.57 seconds, Helio Castroneves takes the Indy Japan 300 in masterful fashion. Last winning at the Twin-Ring Motegi during the 2006 season, Castroneves won his third race of the 2010 IZOD IndyCar season and his 2nd straight victory by leading 153 of the 200 laps around the Twin-Ring Motegi circuit. Acting as a delightful escape from the actions of the championship points scravaging through the event, Castroneves' performance had no doubt affected Franchitti's plans to further capitalize over Will Power. Powerful, but not enough to beat Castroneves, Dario Franchitti takes third as well as a 5 point gain over Will Power in the 2010 IZOD IndyCar Series overall championship. "We can only control what we do and we did our best." Franchitti summed up his day as part of post-race comments. Remembering too well the heated end of the IZOD IndyCar Honda Edmonton Indy less than 2 months ago, Helio Castroneves' protest against a late-race blocking penalty divided the Penske Racing drivers as Power expressed Castroneve's car did indeed block. In this instance, it's fair to reason Will Power became a fan of his teammate. In respect to himself, Will Power posted a first, momentus career podium finish on an oval for either a Champ Car or IRL-backed event. Will Power said "It's great for us to put the Verizon car on the podium. I've never finished ahead of him (Dario) on an oval and one day I'll get it. Hopefully this year because if I don't, he'll win". With Briscoe coming fourth to the line, Danica Patrick in the #7 Godaddy.com car finished a hard-fought 5th rising 7 positions as the highest result for an Andretti Autosport car. This is the 3rd year in a row Patrick has led the Andretti Autosport team at the Twin-Ring Motegi and keeps alive a career-wide streak of top-10 finishes in Indy Japan 300. In two weeks time, Homestead-Miami Speedway will not only provide one driver with an opportunity of the final race trophy of the 2010 IZOD IndyCar season as well as deciding whether Will Power or Dario Franchitti will wear the American open wheel crown.